The Legend of Zelda: Ocarina of Time is my absolute favorite video game. So it was natural that I would pick up its sequel back in the 90’s. I even had the special edition gold cartridge with the holographic label. But Majora’s Mask is a different sort of game, and it gives a unique take on the typical Zelda formula. It was an awesome game, there’s no question about that. And after Nintendo remade Ocarina of Time for the 3DS, fans were hopeful that Majora’s Mask would come next. But is the remake worth the hype? 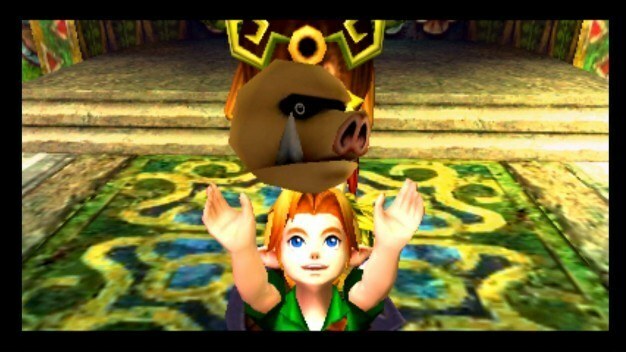 First, a recap for those who missed Majora’s Mask the first time. The game features our young hero Link as he chases a mysterious Skull Kid to the land of Termina, a land very much like Hyrule, but also very different. The skull kid has stolen the evil and powerful Majora’s Mask and plans to bring the moon crashing down to Termina in 3 days. Link has that long to stop him, using the Ocarina of Time to reset the clock when more time is needed. Gameplay is, for the most part, similar to other 3D Zelda games. 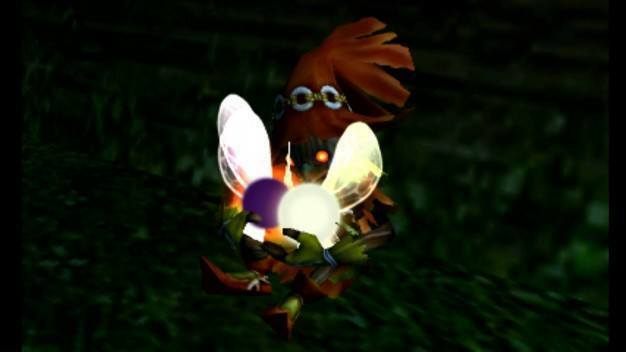 There are, however, a few unique things that make Majora’s Mask a favorite. For one, there are many side quests based around the 3-day structure. Different things have to happen at different times and on different days, and some areas are only accessible on certain days. Each cycle of days will be slightly different, due largely to your actions as Link. All of this makes Termina feel like a very real, very living place. It’s something that the likes of Fable and The Elder Scrolls would build upon years later, and it makes you want to save this world that much more. 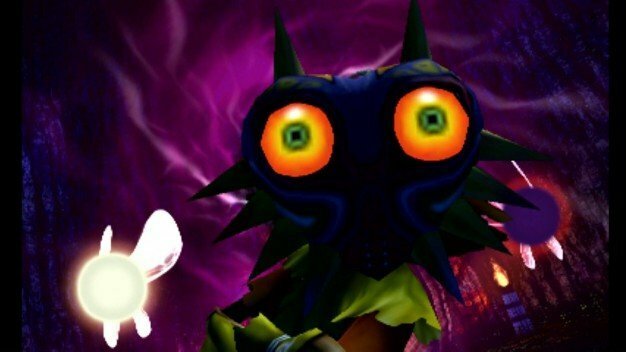 This connects to the next major difference: Majora’s Mask is much darker than the rest of the series. Whether they know it or not, the people of Termina are living out their last days. Any triumph or victory they achieve is short-lived, as it will be erased either by the falling moon or the Song of Time. This is especially visible in the wide reaching side quest of Anju and Kafei: Link’s actions to help these star crossed lovers lasts until the final minutes of the third day; you can probably guess how long their happiness will last. The characters, and the game itself, don’t shy away from the idea of death. In fact, it actually comes up a lot. Death drives the story in multiple ways, and that’s a rare and interesting prospect in any game, let alone a Nintendo game. Finally, and most interestingly for me, this game has Link take three alternate forms besides his normal one: a Deku Scrub, a Zora, and a Goron. Each form has different abilities and thrives in different areas. It also affects the story and the reactions of NPCs; Link can blend into parts of the world that would otherwise be foreign to him. This means that there is a lot of variety in the gameplay, and there is a wider variety of places to go. There are also more ways to get around: you can ride on Epona as normal Link, fly between flowers as Deku Link, swim as Zora Link, or roll around at high speeds as Goron Link. It’s true that some of this could be done with items instead, but that wouldn’t be nearly as interesting. Using the different forms is tons of fun, and this is the only main series game that lets you play as the well known non-human races of Hyrule (or in this case, Termina). If you’re a fan of any of those, this is a great opportunity. There’s also one more transformation mask: the Fierce Deity Mask, which transforms Link into a ridiculously powerful adult form. It’s so awesome that you can only use it during boss battles…and in the newly-added fishing holes. That should be enough to convince anyone who hasn’t already played the N64 version, but those who have should know that the remake comes with a host of updates. Many of these are the same as in Ocarina of Time 3D: there are better graphics, a lot of details are moved to the bottom screen, you can aim with the gyroscope, and it’s in 3D. There’s also a new saving system that makes things a lot easier, and a host of minor improvements. In terms of the graphics, these screenshots definitely don’t do them justice. There are some additional things to note, too, if you have the New 3DS. You can now move the camera freely with the C Stick, allowing more delicate control than just pressing L to center the camera behind Link. This takes some getting used to if you’re a veteran of the series, but it works really well once you remember to use it. The New 3DS’s improved 3D functionality also means that you can use the aforementioned motion controlled aiming with the 3D on. This is one of the games that launched with the New 3DS, so you can bet they go together quite well. There is one thing they didn’t improve with the remake, though, and it’s always been my biggest issue with Majora’s Mask: it’s too short. 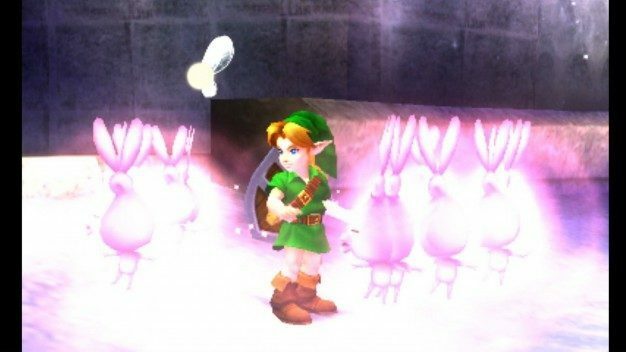 There are only 4 main dungeons, compared to 9 in Ocarina of Time. This is helped somewhat by the many side quests I mentioned before, but it still adds up to a pretty short game. The portable nature of the remake does help here as well, though, as one is more likely to play it in short bursts. Being a 3DS game also means it’s cheaper than it would be as a Wii U game, so keep that in mind as well. Either way, don’t let the length stop you from picking up an amazing title. 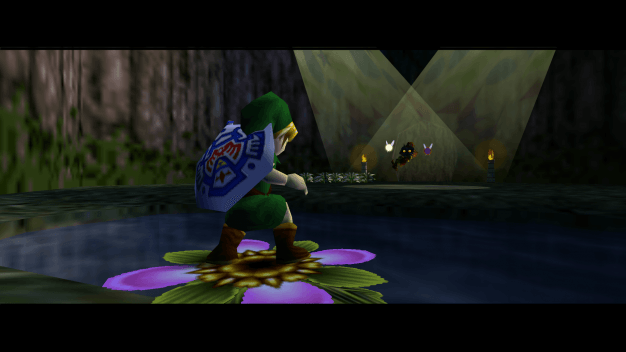 For those new to Majora’s Mask, it’s a one of a kind adventure that shouldn’t be missed. For those who have journeyed through Termina before, the improved graphics and all of the other changes make it worth a second look.